Welcome to the Hero Arts Season of Wonder Release Blog Hop! I am so happy to be sharing alongside this amazing list of friends. You should have arrived from Amy Tsuruta's blog but if not, I have the entire hop list at the bottom. You can find all the new Hero Arts holiday products HERE. It's time to shop! I have two very different cards to share for the Season of Wonder Hero Arts Winter Catalog hop. The catalog is just amazing. Hero Arts has created a beauty! My first card uses the AMAZING Blue Glimmer Metallic Ink. I watercolored my own striped background and set aside to dry. For my focal point, I've used the snowman and trees from Holiday Cheer. I love the graphic look to this set! I created my snow "hill' out of a white die cut circle and tucked my trees and snowman in the scene with some of the elements with foam adhesive. My second card uses the Color Layering Poinsettia Bundle. Hero Arts has done everything for you with this set......all the inks to help you do beautiful color layers for this poinsettia. The poinsettias were added to a panel of red cardstock that has a layer of polka dot vellum. I gold heat embossed the centers of the poinsettias and carried that through with my die cut sentiment, Wishes Stamp and Cut, and some gold gems. There will be TWO $50 shopping sprees to the Hero Arts online store, randomly drawn from comments left across all the blogs in the hop. 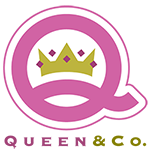 Comment on the blogs by 11:59 PST on Sunday, August 26. Amy, these are wonderful...love the first one! Love your cards Amy! 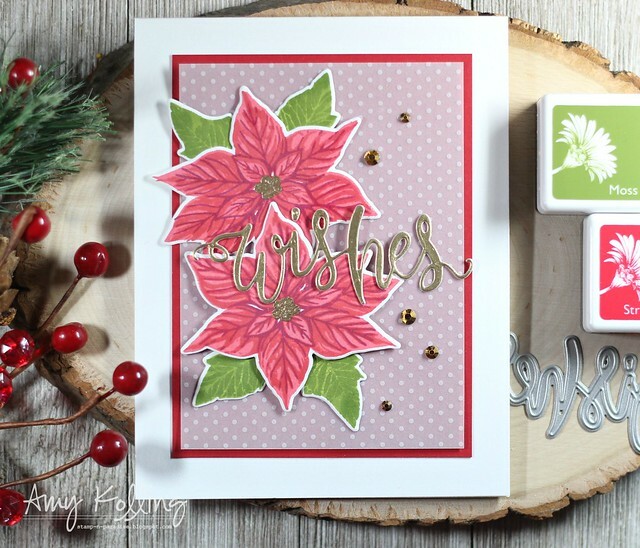 The striped background is great, and your poinsettia card is gorgeous! AWESOME creations! I especially love the poinsettia card! Fun cards. I love your stripey background! The layers poinsettia is so pretty. It's a perfect size to be used many ways on cards. Beautiful Cards! Love the use of the Metallic ink as the striped background. Very Creative designs! Love the blue stripes background; simple yet impactful! I love both of these cards but that snowman just grabs the heart! Thanks her a chance on the Hop! The poinsettias are beautiful, and the little snowman is absolutely adorable! In love with the Color Layering Poinsettia Bundle card... It's absolutely beautiful. I like your color stories: the blues on one and the reds on another. I love the bright blue and white colors in your cute little snowman card! This is so perfect for the winter season! Gorgeous cards! Love the shimmer and shine of the Glimmer Metallic inks. Really like both your cards. Those Metallic Glimmer Inks look so versatile. Love having a bit of shine on a card, especially for Christmas. Both your cards are great! There is so much in the winter catalogue! That snowman card is adorable! Gorgeous cards. Hard to believe it's time to start thinking about Christmas cards! Great cards, love the backgrounds. This ink looks fun & gives such beautiful results. Your cards are proof of that. I really like the metallic blue striped background. The way you finished the card with the circle die, trees and snowman was very clever. Adorable and lovely cards!! I am going to CASE that beautiful background on the first one!! Thanks for sharing. Beautiful cards. I love them both. Thanks for sharing. Love your cards! They are all very creative. Great job. Wonderful cards. Thanks for sharing with us! Both cards are well done - TFS!!! Oh my gosh, this snowman is so stinking cute! I love it. Just lovely! I am loving the metallic inks. 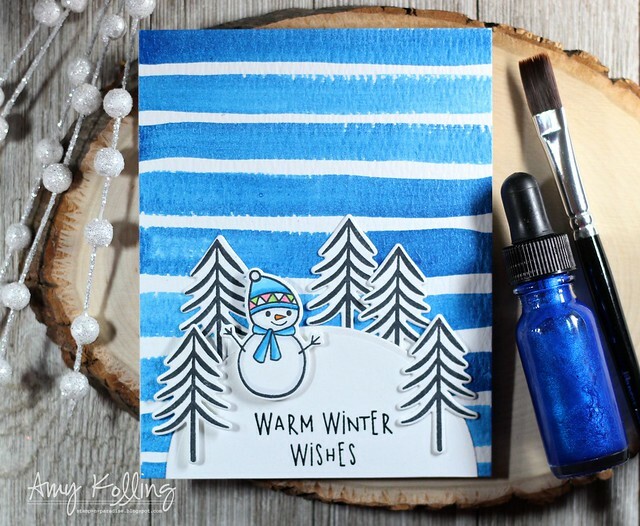 That blue glimmer ink is fantastic on your wintery card with the snowman. Definitely on my wish list now. Very nice cards! I especially like that little snowman and trees with the fun striped background. Really like the bright blue stripes on the snowman card. Really love your poinsettia card. Really speaks Christmas!! Mr. Snowman is my FAVORITE! that card is just screaming fun and happiness. I love this idea!!!! Oh, that first card is gorgeous!! I love those bold blue stripes - what an amazing background!!! 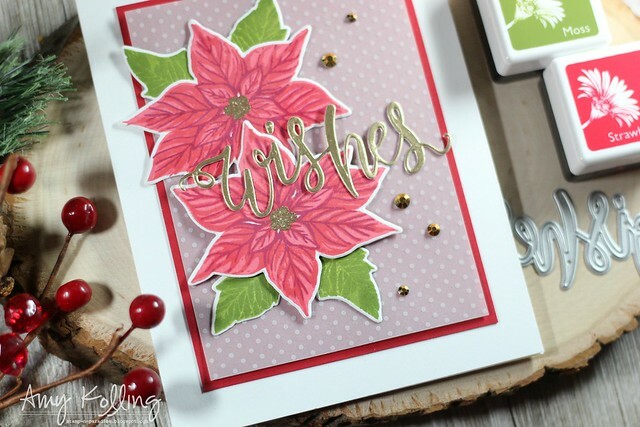 The poinsettia card is just so striking and I love the gold accents you added. Beautiful cards. So bright and happy. That snowman is the cutest. I love that little snowman! Great background! Sweet cards! Love the release! Very cute cards, really like the snowman card. Great cards, that snowman with the blue glimmer paint is a standout, it's so cute! fabulous cards, Amy, especially the adorable snowman card! Love both of your beautiful cards but that snowman card is fabulous! Both cards are awesome. Thanks for sharing your talents with us. Sweet cards! I especially like the cobalt blue stripes. Amy, lovely cards. The poinsettias card is pretty. Love your poinsettia card Amy. They make me think 'christmas'. Lovely cards! :) Thanks for sharing! darling snowman card and beautiful poinsettias card - great inspiration for this wonderful release! These are wonderful! I love that cute little snowman!! 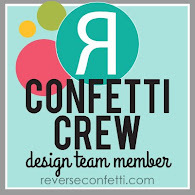 Loving your designs! Very clean & colorful! The poinsettia card is beautiful. Love the poinsettia card. The pink color is so pretty. The snowman card is really cute. Thanks for the inspiration. I am really liking the metallic inks. Thanks for the inspiration. The poinsettias are gorgeous!! Very beautiful card!! The snowman is very cute too. Wonderful job on both! This new collection is awesome. Thank you for sharing your card ideas. Such sweet cards! I love your color choices on the poinsettias. TFS! Cute snowman scene--I like the stripes--and beautiful poinsettia card. Adorable snowman...such a sweet card. Both cards are Great! Very creative snowman scene in the first card. Thanks for sharing your "thinking out of the box" creativity! Have a wonderful day. Beautiful cards!. Love the snowman. Great ideas! Who doesn't like a cute snowman... yours is sweet with the trees around him. Great cards. I kept going back to the poinsettia card to see why I was so attracted to it - after all, I've seen lots. I've even made lots and even painted lots. I think it is the vellum background, it is so subtle, but perfect for this card. Great job and thank you! Lovely cards, those inks look amazing and love your poinsettias! Wonderful cards!! Your little snowman is so cute. Nice snowman scene & pretty Poinsettias. Two delightfully diverse cards for your portion of the hop. That little snowman is so sweet and fun. Love the blues. I also love the very traditional poinsettia. Beautifully crafted. Poinsettias are always in seasonal style. Love the cards, you have inspired me to get started on my Christmas cards. Fantastic cards! I love those vibrant blue stripes! I love the look you got with the Blue Glimmer Metallic Ink for the background on the first card. This stuff looks amazing, I can't wait to try it. Your poinsettia card is stunning. Thank you for sharing. Great colour blue with that shimmer, do love the snowman card set, reminds me of cute children's drawings. I'm not a poinsettias fab but these do look very realistic in deed. Thanks. Both beautiful cards and so different. Thanks for sharing. Love the techniques you chose to use! Great cards for sure! Loving this hop! Love your cards! The new inks are at the top of my wishlist. 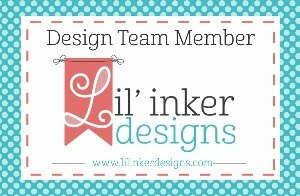 Love your cards--and the blue stripe background is genius! Both of your cards are great--the snowman is so darn cute! Oh, I just love seeing that metallic ink at work! So vibrant and beautiful! Top of my list! Pretty cards. I am in love with the first one. The background is so beautiful. Great cards! I really need to have those glimmer metallic inks in my life. Thanks for sharing. Love the layering poinsettias, great cards. Such festive cards! Adorable and sweet. Beautiful and classic. Amazing designs. Two wonderful cards! I just love that Blue Glimmer Metallic Ink! What a wonderful way to end the hop! I love your poinsettia card! The gold centers are a nice touch! Thanks for sharing and inspiring! The poinsettias are just lovely! I NEED those glimmer metallics... gorgeous shimmery glimmery stripes!!! Adorable snowman and beautiful poinsettias! Delightful cards! I can't wait to try the paints! I am totally amazed at how much detail shows up in the poinsettia stamps! Aren't they lovely?? Lovely cards you've shared today. Thanks for the inspiration.